In many ways, a motorcycle accident is different from other vehicle accidents. The motorcycle rider is exposed and more vulnerable, so injuries sustained tend to be severe. It can also be difficult to prove the liability, since drivers who hit motorcycles often claim they never saw the bike coming or that it “came out of nowhere.” Juries are often susceptible to suggestions that bikers are risk-takers who routinely make unsafe maneuvers until they cause an accident that leaves them seriously hurt. 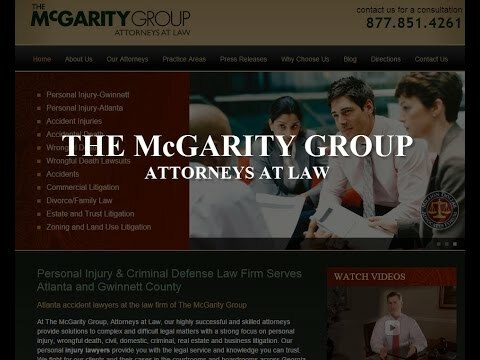 If you or a loved one has been seriously injured in a motorcycle accident, you need a determined team of legal advocates on your side.McGarity and Efstration is comprised of trustworthy, tenacious and knowledgeable lawyers who take great pride in serving the needs of motorcycle accident victims. State law in Georgia requires all motorcyclists to wear a helmet and eye protection. The law also prohibits lane-splitting. If you violated any of these provisions, the defendant may attempt to prove that you were at least partially responsible for the accident, and ask that the court reduce or bar your recovery under Georgia’s comparative negligence statute. For example, imagine you were not wearing eye protection (and your bike did not have a windscreen). As you approached an intersection, an insect flew into your eye, distracting you at the very moment a car ran a stop sign, causing you to hit the side of the car in a T-bone accident. The driver is obviously at fault for running the stop sign, but will argue that you are also at fault: if you’d worn eye protection, you would have seen the car enter the intersection. You could have stopped, turned or slowed enough to avoid or lessen the severity of the crash. Likewise, the driver could argue that the only reason your head injuries are severe is because you didn’t wear a helmet. If the court decides that riding without a helmet made your head injury 40 percent worse, it can reduce your damage award by 40 percent. If the court decides that the only reason you suffered a head injury was the failure to wear a helmet, it can bar you from recovering any amount for your head injury. However, if your failure to wear a helmet did not cause the accident, and you are not claiming a head injury, then the fact that you didn’t follow the law is irrelevant to your case. Our firm is committed to investigating your accident thoroughly to ascertain any facts that can help your case. Can a defective road cause a motorcycle accident? While frustrating and unsettling to passenger cars, potholes and uneven pavement can cause serious injury to motorcyclists. If you sustain an injury due to a defective road, you may bring a lawsuit against the state. However, to do so, you need to speak to a knowledgeable Gwinnett County personal injury lawyer as soon as possible. If you or a loved one has suffered a severe injury or wrongful death in a motorcycle accident, talk to a caring and committed attorney at McGarity and Efstration. Our determined lawyers fully investigate every case we undertake, so we can fight for the maximum amount of compensation possible. To schedule a free consultation, call our Buford or Braselton office today at 877.851.4261 or contact us online.